My weekend was rather lovely. Hubby was back after a week away with work so we had a great big snuggly family lie-in yesterday. We also got some things achieved around the house and I managed to make it out for a run. I did 6km which wasn't bad. I want to be back going further but this will have to do for now. But the best bit was spending time on both Saturday and Sunday just hanging out with good friends. I really needed a bit of that. I even managed to find myself relaxing a little bit. Oh how I wish I could be a chilled out person! This photo makes me wish even harder than I already am for spring. 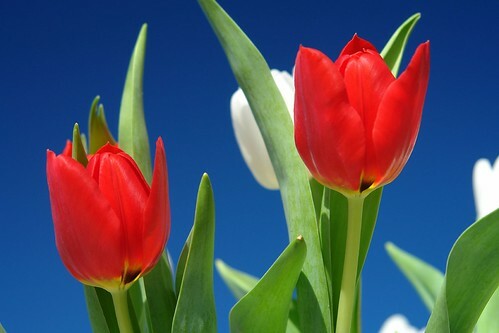 I love tulips and I love bright blue skies. These bold colours are so fantastic and mood-lifting. I want to be taking photos like this myself. I want to stop feeling cold all the time. I want sunshine. I want to stop feeling like the weight of the world is on my shoulders because it really isn't.